Workshop is from 9:30 a.m.-4:30 p.m. both days. For intermediate to advanced. Have you ever wondered what came just before Copperplate or lettering of the pointed pen? Some of the most beautiful letters in history have come from the pens of the Italian Writing Masters. During the Renaissance some Italian and other European writing masters who had their writing manuals printed by a copper plate method were moving away from the more formal Italic toward a hand a little more suited to be copied from onto the copper plates used for intaglio printing. It is these transitional hands that, in the late 20th century have become known as a pre-Copperplate Italic. 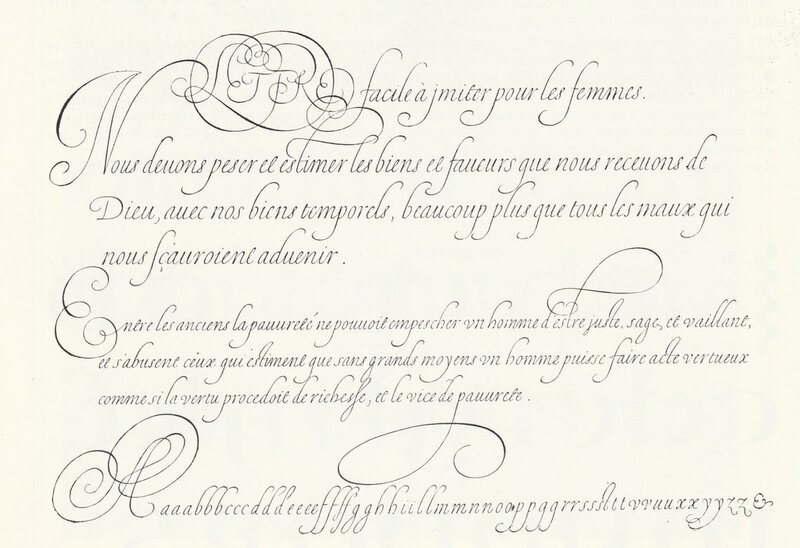 Not a formal Italic but rather a hand resulting in more elegance and cursive in structure. In this two-day class we will explore the history of these elegant hands and work a series of selective exercises leading to the understanding of the nuances of certain writing masters such as Cresci, Antonozzi and Materot among others. Cresci would never have called this hand “pre-copperplate Italic” but rather a “Chancellaresca Corsiva”. The catalogue for the London exhibition “The Universal Penman” (not to be confused with George Bickham’s Universal Penman) states: “Cresci was interested in introducing a hand that was more fluent and speedy than others practiced at the time. The class will be one of learning sound letter forms and spacing techniques in an environment of encouragement and fun where the participants will take home examples to explore further in their own works spaces. A strong component of the class will also be on research methods. Gemma Black is an artist, teacher and calligraphic-designer. In 1991 Gemma received a Winston Churchill Fellowship to study in Europe that allowed her to research, observe and learn the practice of calligraphy. She is an Honoured Fellow and Fellow of the prestigious Calligraphy & Lettering Arts Society, UK. For over 25 years Gemma has taught extensively for calligraphy, bookbinding, art & craft organisations around Australia including the Australian National University. She has also joined the faculty at international lettering-art conferences in Italy, Germany, the USA, Canada and the UK. Her work is housed in private and public collections including the Fitzwilliam Museum, Cambridge, UK, the European Parliament and Parliament House Canberra. Gemma teaches a variety of art techniques that involve mostly calligraphy, simple book structures, decorative paper techniques, abstract watercolour painting and grounds for calligraphy. She also has a series of illustrated calligraphy lectures available for presentation.